This is a guest article by Monique Winterhoff. 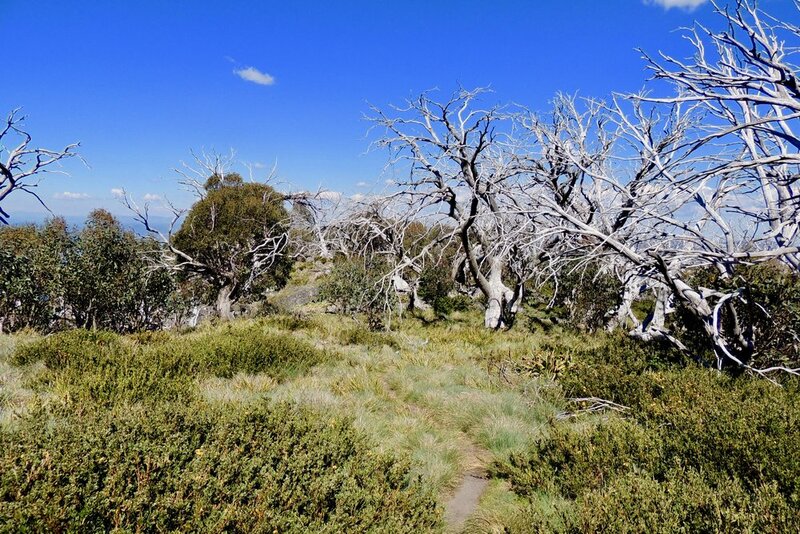 Reaching the summit of Mount Cobbler can be quite challenging, but the outstanding 360-degree views of the Victorian Alps make the trek well worth the effort. The climb to Mount Cobbler can be done as part of a longer trail, the Mount Cobbler Plateau Circuit, but one of the simplest routes to take is the four-hour return walking track from Lake Cobbler up to the summit of the mountain. Lake Cobbler is around a five-and-a-half-hour drive north-east from Melbourne, where four-wheel drive vehicles are recommended, as roads can be rough for two-wheel drive vehicles past Bennies. It is recommended to check the Parks Victoria website for road and trail conditions ahead of time, as the trail is only accessible in warmer months due to closure of the Alpine National Parks roads during winter. The trail starts 50 metres east of Cobbler’s Hut at Lake Cobbler, following along an old four-wheel drive track before descending to a small creek crossing. From there, the trail has a short, steep climb before easing into a moderate slope. For the majority of the trail, the hike is through beautiful eucalypt forests, surrounded by mountain gums and broad-leafed peppermints. Closer to the peak, the forest opens out to patches of heathland, grassland and herb fields growing between rocky escarpments. In spring, the wildflowers begin to bloom, resulting in a flurry of pinks, reds and yellows along the trail. At the mountain's summit, there are spectacular 360-degree views of Victoria's stunning alpine region. Though the elevation and exposed terrain allows for spectacular views at the summit, this does mean exposure to the elements, so it is important to check the weather forecast before heading out for the hike. However, with a bit of planning, the hike to Mount Cobbler can make for an unforgettable weekend trip. Spectacular views over the Victorian Alps. Summit reaching 1,628m in elevation. 5.5-hour drive north-east from Melbourne. Be wary of weather and driving conditions.